Morris Plains was incorporated as a borough by an act of the New Jersey Legislature on March 15, 1926, from portions of Hanover Township, based on the results of a referendum held on April 15, 1926. The borough's name comes from Lewis Morris, colonial governor of New Jersey. Morris Plains serves as a bedroom community, with many residents traveling to work in New York City. The Morristown Line of NJ Transit provides commuters with direct access to New York Penn Station and to Hoboken Terminal. According to the United States Census Bureau, the borough had a total area of 2.594 square miles (6.718 km2), including 2.557 square miles (6.623 km2) of land and 0.037 square miles (0.095 km2) of water (1.42%). Unincorporated communities, localities and place names located partially or completely within the township include Littleton. The climate in this area is characterized by hot, humid summers and generally mild to cool winters. According to the Köppen Climate Classification system, Morris Plains has a humid subtropical climate, abbreviated "Cfa" on climate maps. As of the 2010 United States Census, there were 5,532 people, 2,131 households, and 1,485.307 families residing in the borough. The population density was 2,163.5 per square mile (835.3/km2). There were 2,197 housing units at an average density of 859.2 per square mile (331.7/km2). The racial makeup of the borough was 89.44% (4,948) White, 2.73% (151) Black or African American, 0.09% (5) Native American, 4.97% (275) Asian, 0.00% (0) Pacific Islander, 1.07% (59) from other races, and 1.70% (94) from two or more races. Hispanic or Latino of any race were 5.68% (314) of the population. There were 2,131 households out of which 32.3% had children under the age of 18 living with them, 61.3% were married couples living together, 6.4% had a female householder with no husband present, and 30.3% were non-families. 24.9% of all households were made up of individuals, and 13.1% had someone living alone who was 65 years of age or older. The average household size was 2.57 and the average family size was 3.12. In the borough, the population was spread out with 24.8% under the age of 18, 4.7% from 18 to 24, 25.4% from 25 to 44, 28.5% from 45 to 64, and 16.6% who were 65 years of age or older. The median age was 42.1 years. For every 100 females there were 93.5 males. For every 100 females ages 18 and older there were 89.4 males. The Census Bureau's 2006-2010 American Community Survey showed that (in 2010 inflation-adjusted dollars) median household income was $103,688 (with a margin of error of +/- $12,744) and the median family income was $127,614 (+/- $20,257). Males had a median income of $91,908 (+/- $21,398) versus $67,232 (+/- $24,331) for females. The per capita income for the borough was $45,165 (+/- $10,332). About 0.4% of families and 9.5% of the population were below the poverty line, including 0.0% of those under age 18 and 0.6% of those age 65 or over. As of the 2000 United States Census there were 5,236 people, 1,955 households, and 1,477 families residing in the borough. The population density was 2,018.7 people per square mile (780.6/km2). There were 1,994 housing units at an average density of 768.8 per square mile (297.3/km2). The racial makeup of the borough was 92.91% White, 1.34% African American, 0.06% Native American, 4.32% Asian, 0.10% Pacific Islander, 0.40% from other races, and 0.88% from two or more races. Hispanic or Latino of any race were 2.69% of the population. There were 1,955 households out of which 33.1% had children under the age of 18 living with them, 67.0% were married couples living together, 7.0% had a female householder with no husband present, and 24.4% were non-families. 19.7% of all households were made up of individuals and 8.6% had someone living alone who was 65 years of age or older. The average household size was 2.63 and the average family size was 3.05. In the borough the population was spread out with 23.5% under the age of 18, 4.4% from 18 to 24, 29.4% from 25 to 44, 26.4% from 45 to 64, and 16.2% who are 65 years of age or older. The average age is 41 years. For every 100 females, there were 92.2 males. For every 100 females age 18 and over, there were 86.6 males. The median income for a household in the borough was $84,806, and the median income for a family was $98,333. Males had a median income of $75,040 versus $44,554 for females. The per capita income for the borough was $36,553. About 1.5% of families and 2.4% of the population were below the poverty line, including 3.0% of those under age 18 and 2.4% of those age 65 or over. The borough has been a major base of operations for Pfizer, previously the headquarters for Warner-Lambert. Pfizer has sponsored the Health and Medical Science Academy at Morristown High School and an annual 5k race around Morris Plains. In 2012, a 63-acre (25 ha) property owned by Pfizer on the west side of Route 53 was acquired by M&M Realty Partners, which plans to redevelop the site for a mixed use development that would include 500 housing units and 100,000 square feet (9,300 m2) for retail use. In 2015, Honeywell moved into a 475,000-square-foot (44,100 m2) headquarters on a 40-acre (16 ha) campus, after relocating from AlliedSignal headquarters in Morristown. 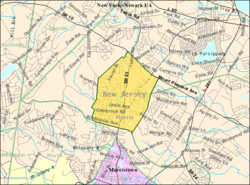 Morris Plains is governed under the Borough form of New Jersey municipal government. The governing body consists of a Mayor and a Borough Council comprising six council members, with all positions elected at-large on a partisan basis as part of the November general election. A Mayor is elected directly by the voters to a four-year term of office. The Borough Council consists of six members elected to serve three-year terms on a staggered basis, with two seats coming up for election each year in a three-year cycle. The Borough form of government used by Morris Plains, the most common system used in the state, is a "weak mayor / strong council" government in which council members act as the legislative body with the mayor presiding at meetings and voting only in the event of a tie. The mayor can veto ordinances subject to an override by a two-thirds majority vote of the council. The mayor makes committee and liaison assignments for council members, and most appointments are made by the mayor with the advice and consent of the council. As of 2016[update], the Mayor of Morris Plains is Republican Frank J. Druetzler, whose term of office ends December 31, 2018. Members of the Borough Council are Council President Jason C. Karr (D, 2016), Joseph Cecala Jr. (R, 2018), Salvatore "Sal" Cortese (R, 2017), John "Jack" Doherty (R, 2017), Laurie Fu (R, 2018) and Suzanne B. McCluskey (R, 2016). The Morris Plains Municipal Court judge is Michael A. Carlucci. The Morris Plains Police Department has 17 sworn officers. The command structure has a chief, two lieutenants, five sergeants, nine patrolmen and six civilians. They are dispatched through the Morris County Communication Center who dispatches for the police, fire and first aid departments. The police department handled over 29,000 calls for the year 2010. Morris Plains is located in the 11th Congressional District and is part of New Jersey's 26th state legislative district. As of March 23, 2011, there were a total of 3,935 registered voters in Morris Plains, of which 853 (21.7%) were registered as Democrats, 1,695 (43.1%) were registered as Republicans and 1,381 (35.1%) were registered as Unaffiliated. There were 6 voters registered to other parties. In the 2012 presidential election, Republican Mitt Romney received 53.3% of the vote (1,659 cast), ahead of Democrat Barack Obama with 45.9% (1,429 votes), and other candidates with 0.9% (27 votes), among the 3,142 ballots cast by the borough's 4,140 registered voters (27 ballots were spoiled), for a turnout of 75.9%. In the 2008 presidential election, Republican John McCain received 52.3% of the vote (1,725 cast), ahead of Democrat Barack Obama with 45.8% (1,511 votes) and other candidates with 0.8% (27 votes), among the 3,297 ballots cast by the borough's 3,994 registered voters, for a turnout of 82.5%. In the 2004 presidential election, Republican George W. Bush received 55.9% of the vote (1,783 ballots cast), outpolling Democrat John Kerry with 42.8% (1,365 votes) and other candidates with 0.8% (31 votes), among the 3,191 ballots cast by the borough's 3,921 registered voters, for a turnout percentage of 81.4. In the 2013 gubernatorial election, Republican Chris Christie received 70.8% of the vote (1,399 cast), ahead of Democrat Barbara Buono with 27.9% (551 votes), and other candidates with 1.4% (27 votes), among the 2,025 ballots cast by the borough's 4,122 registered voters (48 ballots were spoiled), for a turnout of 49.1%. In the 2009 gubernatorial election, Republican Chris Christie received 58.6% of the vote (1,337 ballots cast), ahead of Democrat Jon Corzine with 31.5% (719 votes), Independent Chris Daggett with 8.4% (191 votes) and other candidates with 0.4% (10 votes), among the 2,283 ballots cast by the borough's 3,898 registered voters, yielding a 58.6% turnout. The Morris Plains Schools educate public school students from pre-kindergarten through eighth grade. As of the 2014-15 school year, the district and its two schools had an enrollment of 845 students and 59.1 classroom teachers (on an FTE basis), for a student–teacher ratio of 14.3:1. Schools in the district (with 2014-15 enrollment data from the National Center for Education Statistics) are Mountain Way School for grades K-2 (204 students) and Morris Plains Borough School for grades 3-8 (409 students). Students in public school for ninth through twelfth grades attend Morristown High School, as part of a sending/receiving relationship with the Morris School District which also serves the communities of Morristown and Morris Township (for grades K-12). As of the 2014-15 school year, the high school had an enrollment of 1,678 students and 124.0 classroom teachers (on an FTE basis), for a student–teacher ratio of 13.5:1. Saint Virgil Academy, founded in 1910, is a Catholic school serving students in preschool through eighth grade (including PreK3 and PreK4) that operates under the auspices of the Roman Catholic Diocese of Paterson. As of May 2010[update], the borough had a total of 28.66 miles (46.12 km) of roadways, of which 24.15 miles (38.87 km) were maintained by the municipality, 1.81 miles (2.91 km) by Morris County and 2.70 miles (4.35 km) by the New Jersey Department of Transportation. U.S. Route 202, New Jersey Route 10 and New Jersey Route 53 are the main highways serving Morris Plains. Interstate 80 and Interstate 287 are both accessible in neighboring Parsippany-Troy Hills Township. NJ Transit provides service at the Morris Plains station on the Morristown Line to Newark Broad Street Station, Secaucus Junction, New York Penn Station and Hoboken Terminal. The one-story red brick station house, constructed in 1915 in Renaissance Revival style, was added to the National Register of Historic Places on June 22, 1984. NJ Transit provides local bus service on the 872, 875 and 880 routes, replacing service that had been offered on the MCM2, MCM3 and MCM10 routes until 2010, when subsidies to the local provider were eliminated as part of budget cuts. In The Sopranos episode "Made in America", Phil Leotardo is shot to death at a Morris Plains Raceway gas station, located on route 10, before being run over. See also: Category:People from Morris Plains, New Jersey. Robert Martin (born 1947), State Senator since 1993 who represents the 26th Legislative District. Richard Aldrich McCurdy (1835-1916), attorney, business executive and banker during the Gilded Age who served as the President of the Mutual Life Insurance Company of New York from 1885 to 1906. Charley Molnar (born 1961), former head football coach at the University of Massachusetts Amherst. Carol Murphy (born 1932), member of the New Jersey General Assembly from 1992 to 2000. Gustav Stickley (1858-1942), furniture manufacturer, design leader, publisher and the chief proselytizer for the American Craftsman style. Louis A. Thebaud (1859-1939), businessman, sportsman and philanthropist in the Gilded Age. Jay Webber (born 1972), Assemblyman who has represented the 26th Legislative District since 2008 and had served as Chairman of the New Jersey Republican State Committee. Ben Weinman (born 1975), of the band The Dillinger Escape Plan. Arthur Whitney (1871-1942), politician who served in both houses of the New Jersey Legislature and was the Republican nominee for Governor of New Jersey in 1925. Paul Zimmerman (born 1932), football sportswriter for Sports Illustrated. ^ a b c Employee Directory, Borough of Morris Plains. Accessed July 24, 2016. ^ U.S. Geological Survey Geographic Names Information System: Borough of Morris Plains, Geographic Names Information System. Accessed March 8, 2013. ^ a b c d e f DP-1 - Profile of General Population and Housing Characteristics: 2010 for Morris Plains borough, Morris County, New Jersey, United States Census Bureau. Accessed December 19, 2012. ^ a b c Profile of General Demographic Characteristics: 2010 for Morris Plains borough, New Jersey Department of Labor and Workforce Development. Accessed December 19, 2012. ^ Look Up a ZIP Code for Morris Plains, NJ, United States Postal Service. Accessed December 19, 2012. ^ Area Code Lookup - NPA NXX for Morris Plains, NJ, Area-Codes.com. Accessed August 28, 2013. ^ Snyder, John P. The Story of New Jersey's Civil Boundaries: 1606-1968, Bureau of Geology and Topography; Trenton, New Jersey; 1969. p. 195. Accessed October 29, 2012. ^ Historical Timeline of Morris County Boundaries, Morris County Library. Accessed December 24, 2016. "1926, March 15. Morris Plains Borough is established from Hanover Township." ^ Climate Summary for Morris Plains, New Jersey, Weatherbase.com. ^ a b c d e Census 2000 Profiles of Demographic / Social / Economic / Housing Characteristics for Morris Plains borough, New Jersey, United States Census Bureau. Accessed December 19, 2012. ^ a b c d e DP-1: Profile of General Demographic Characteristics: 2000 - Census 2000 Summary File 1 (SF 1) 100-Percent Data for Morris Plains borough, Morris County, New Jersey, United States Census Bureau. Accessed December 19, 2012. ^ DP03: Selected Economic Characteristics from the 2006-2010 American Community Survey 5-Year Estimates for Morris Plains borough, Morris County, New Jersey, United States Census Bureau. Accessed December 19, 2012. ^ Pfizer Property News, Borough of Morris Plains. Accessed October 22, 2013. ^ Bergeron, Tom. "Honeywell opens 'truly awesome building' in Morris Plains", NJBiz, November 16, 2015. Accessed May 19, 2016. "Honeywell Chairman and CEO David Cote formally opened the company's new global headquarters in Morris Plains on Monday morning by talking about the future. The 40-acre campus and 475,000-square-foot building, he said, will give Honeywell the space it needs to continue as one of New Jersey's most important corporations." ^ 2015 Municipal Data Sheet, Borough of Morris Plains. Accessed July 24, 2016. ^ Morris Plains Municipal Court, Morris Plains Police Department. Accessed June 23, 2016. "Judge: Honorable Michael A. Carlucci"
^ Police Organization, Morris Plains Police Department. Accessed February 10, 2008. ^ Statistics, Morris Plains Police Department. Accessed December 19, 2012. ^ District information for Morris Plains School District, National Center for Education Statistics. Accessed December 7, 2016. ^ School Data for the Morris Plains Schools, National Center for Education Statistics. Accessed December 7, 2016. ^ Mountain Way School, Morris Plains Schools. Accessed July 19, 2017. ^ Morris Plains Borough School, Morris Plains Schools. Accessed July 19, 2017. ^ New Jersey School Directory for the Morris Plains Schools, New Jersey Department of Education. Accessed December 29, 2016. ^ Morristown High School 2016 Report Card Narrative, New Jersey Department of Education. Accessed July 19, 2017. "Comprised of 1,848 ethnically diverse students speaking more than 20 different languages, the educational program serves the students entrusted to the school by its communities: Morristown, Morris Township and Morris Plains." ^ School data for Morristown High School, National Center for Education Statistics. Accessed December 12, 2016. ^ Home page, Saint Virgil Academy. Accessed October 22, 2013. ^ Morris Plains station, NJ Transit. Accessed October 22, 2013. ^ Morristown Line, NJ Transit. Accessed October 22, 2013. ^ Morris Plains Station Application, National Register of Historic Places. Accessed October 22, 2013. ^ Morris County System Map, NJ Transit. Accessed July 31, 2015. ^ Morris County Bus / Rail Connections, NJ Transit, backed up by the Internet Archive as of May 22, 2009. Accessed October 22, 2013. ^ Manochio, Matt. "Morris Plains' Raceway: Where Phil got whacked", Daily Record (Morristown), June 12, 2007. Accessed December 19, 2012. "The scene was filmed in Morris Plains, and Route 10's surroundings were clearly visible, including the Barnes & Noble, which stood as a backdrop to some vomiting gas station customers who witnessed Phil's murder." ^ Legislative webpage for Robert J. Martin, accessed May 6, 2007. ^ Prominent Families of New York, p. 386. The Historical Company, 1897. Accessed May 19, 2016. "Mr. and Mrs. Richard A. McCurdy have a city residence in Fifth Avenue, and a country home in Morris Plains, N. J." ^ Fleming, Kerri. "Charley Molnar new UMass football coach", Telegram & Gazette, December 9, 2011. Accessed September 8, 2015. "This will be the first experience in New England for Molnar, 50, a native of Morris Plains, N.J., and an alumnus of Lock Haven (Pa.) University." ^ Assemblywoman Carol J. Murphy, New Jersey Legislature, backed up by the Internet Archive as of February 25, 1998. Accessed June 11, 2010. ^ The Stickley Museum at Craftsman Farms, Visit New Jersey. Accessed May 19, 2016. ^ Postcard No. 9, Morris Plains Historical Postcard Album. Accessed May 19, 2016. ""'Idlewild', the estate of Louis A. Thebaud, stood in the vicinity of present-day Idlewild Drive." ^ Coughlin, Kevin. "Christie taps Morris Plains attorney Jay Webber as state GOP chairman", NJ.com, June 12, 2009. Accessed October 22, 2013. "Republican gubernatorial candidate Chris Christie yesterday tapped 37-year-old conservative Assemblyman Jay Webber of Morris Plains as the GOP party chairman." ^ Garcia, Alfa. "Morris Plains-based metal rockers The Dillinger Escape Plan will perform in Manhattan", The Record (Bergen County), March 11, 2010. Accessed May 19, 2016. "Wilson and bandmates Greg Puciato, Jeff Tuttle, Billy Rymer and Ben Weinman (founding member and Morris Plains native) spend their performances dodging head stocks, guitars and body parts, at the same time challenging their listeners to participate." ^ Staff. "Arthur Whitney, An Ex-Legislator; Former State Senator From Morris County, N, J., Dies in Mendham at 71 Candidate For Governor Retired From Brokerage Firm of Goadby & Co. Here in 1916 to Enter Politics", The New York Times, November 20, 1942. Accessed September 8, 2015. ""Born in Morris Plains, N. J., Mr. Whitney received his education at St. Paul's School, Concord, N. H., which he left at the age of 17 to work for several years in an iron plant in Harrisburg, Pa."
^ King, Peter. "In wake of signing/trade frenzy, a reminder: Free agency is overrated", Sports Illustrated, March 9, 2010. Accessed January 13, 2011. "This was the enjoyable part of the weekend: having lunch with Paul Zimmerman and his wife Linda in Morris Plains, N.J., Saturday." Wikimedia Commons has media related to Morris Plains, New Jersey.